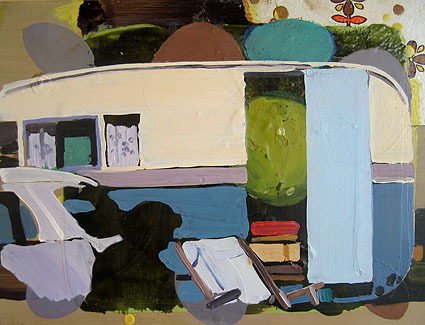 Clark's paintings depict a very particular kind of absurdist Englishness made up of little seaside houses and games of crazy golf. His crazy golf paintings focus on the scale of the figures playing around the abstract shapes of a course while still keeping a strong sense of place and atmosphere. The objects stuck on to the paintings represent the trajectory of the balls or the swing of the putter, and the backgrounds mimic coloured concrete next to bleached grass creating the effect of a giant cartoon sitting in the landscape. For O Dreamland he is also showing a series of small works that combine elements of painting and photography. Jake Clark studied at Falmouth School of Art, Derbyshire College, Brighton Polytechnic and the Royal College of Art. In 1993 and 2002 he was included in the John Moores painting exhibition. His one-person show Dog Days was held at Gas Works Gallery London 1995. Recent shows include Drip Grot at Fosterart, London in 2006 and The Vernacular at Standpoint Gallery, London also 2006.